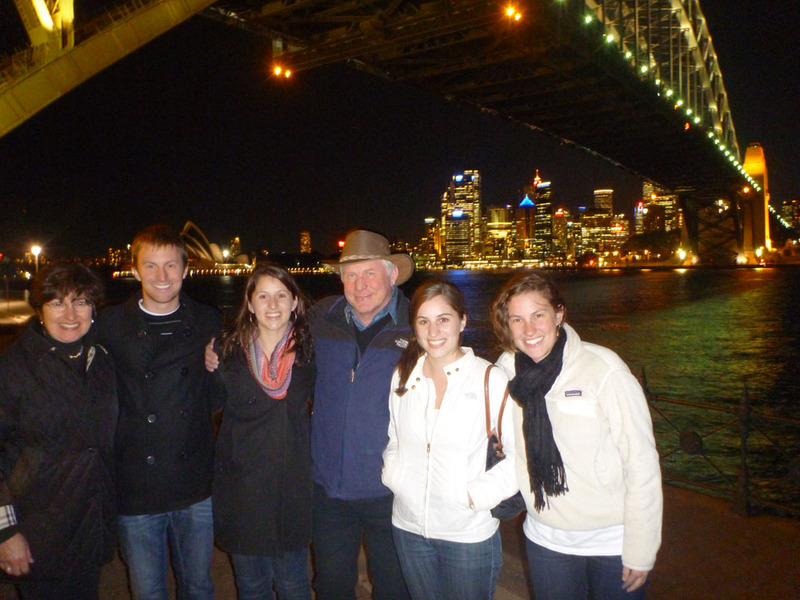 After a couple days of sightseeing in Sydney and a quick trip to visit Ayers Rock/Uluru, the Buterbaugh family was back at the airport on the way to the tour’s next stop. Queenstown lies in the heart of New Zealand’s South Island, often regarded as the more scenic of the two islands. Situated next to a lake between the mountains, Queenstown reputedly received its name after a resident quipped that it was “fit for Queen Victoria”. Whether that’s true may never be known (Victoria never visited), but the area certainly lives up to the Māori name for the lake: “Wakatipu”, or “hollow of the giant”. Our first excursion was one that many visitors to New Zealand take: a tour of the film locations for the Lord of the Rings. While few actual sets remain (the most notable of which being Hobbiton in Matamata, near Auckland), the landscape of New Zealand and its place in the movie trilogy is just as stunning. 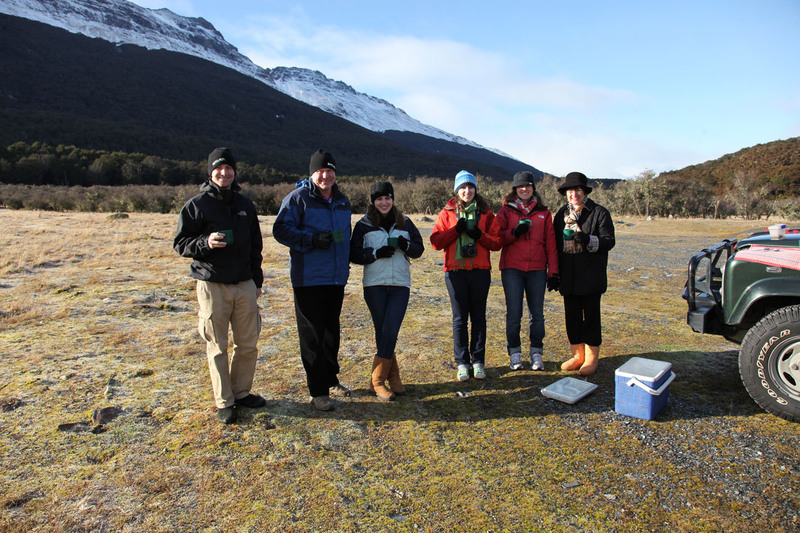 Our Safari of the Scenes took us through Glenorchy to the film location of Isengard before stopping on the way back to the site of Ithilien Camp near an area known as 12 Mile Delta. 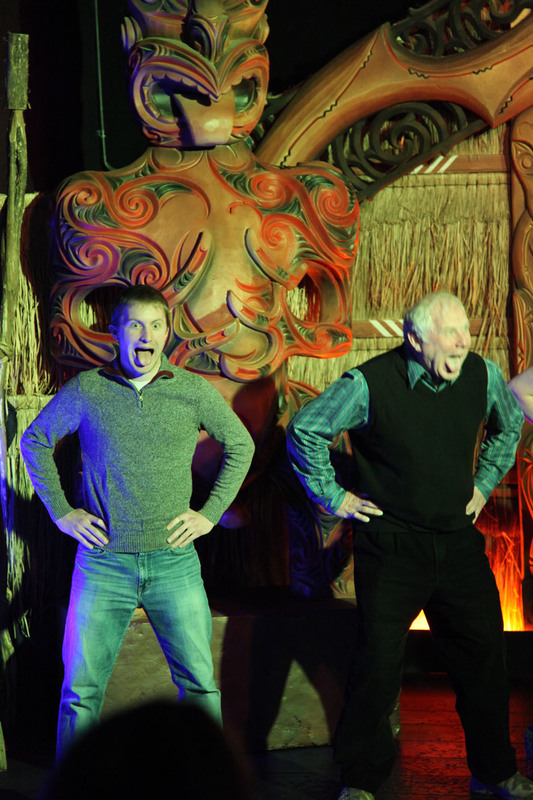 Upon returning to the Heritage Queenstown, we picked up Kristen at the airport before continuing to the Skyline Restaurant for a Kiwi Haka show and dinner. 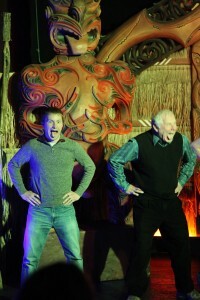 For those of you who follow rugby, you may already be familiar with the Haka performed prior to every game by the All Blacks, New Zealand’s national rugby team. The ceremonial dance is performed for a variety of reasons, but the one we watched prior to dinner was designed to include audience participation. Getting on stage was a bit embarrassing at first, so we did the only thing you can do: jump in with both feet, stick your tongue out and yell at the top of your lungs! 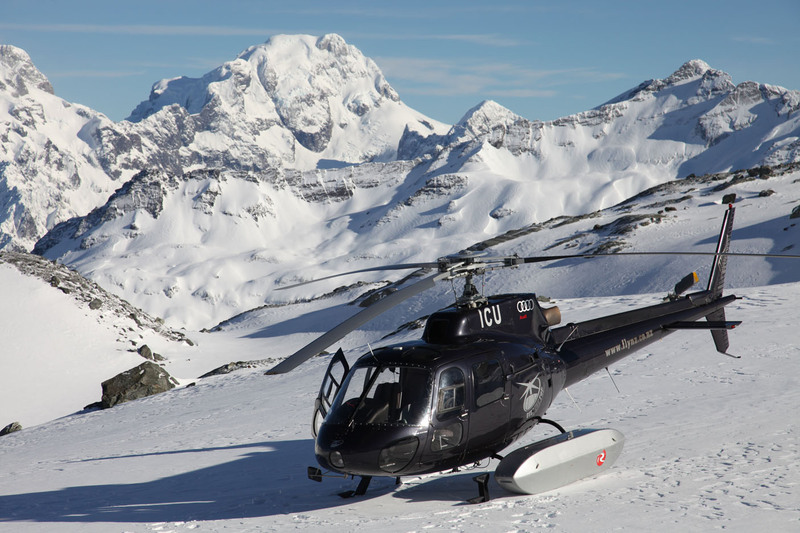 The next day started off early with one of the highlights of the entire Australia and New Zealand trip: a helicopter sightseeing tour over the Southern Alps and Milford Sound. Milford Sound is listed as one of the top attractions of the South Island, but it’s rather tedious to get to by foot or by car. Not so by air, and the views are way better. Our fantastic tour guides at Over The Top took us on an unforgettable ride over Queenstown, past Milford Sound and through the mountains before landing on a glacier and letting us get out and see the mountains up close. After spending a bit of time on the ice and snow, we got back into the choppers and continued back to Queenstown. Our second tour of the day, and the final tour in New Zealand, was a ride through the Shotover Canyon on a Jet Boat. 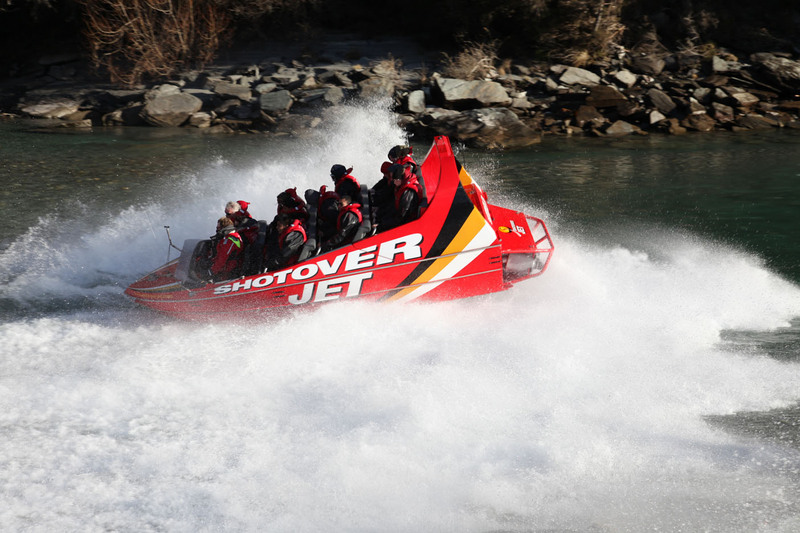 The Shotover Jet boats are specially designed for the canyons, incorporating extra maneuverability and the ability to run in as little as 4″ of water. They also sport one other feature: the ability to perform 360° spins on top of the water. Coming impossibly close to the canyon walls at full speed, the pilot would casually twirl his finger around in the air, which was code for “hold on tight”. He’d then spin the boat completely around in under a second and continue on with barely a pause. After disembarking, we stood on the shore to watch the next boat come in for the perfect photo opportunity. This brought us to the end of our time in Queenstown and I have to say that I agree with the fellow who declared the place fit for royalty. Queenstown is a fantastic place for thrillseekers, adventurers or those seeking a few days of relaxation punctuated by the occasional jolt of adrenaline. Setting all of that aside though, the place is just beautiful, which is reason enough to add it to your list. I’m glad we did. The arrival of the Buterbaugh family marked our second official group of visitors and the first of two family visits. Despite only staying for two weeks, my family had a bunch of planned activities and wasted no time getting started. The day after landing, we headed to the airport to fly to Cairns, the main entry point to the Great Barrier Reef. After landing late Thursday night, we slept for a few hours before heeding an early wakeup call and boarding a shuttle to the docks to catch our dive boat, operated by Tusa Dive. 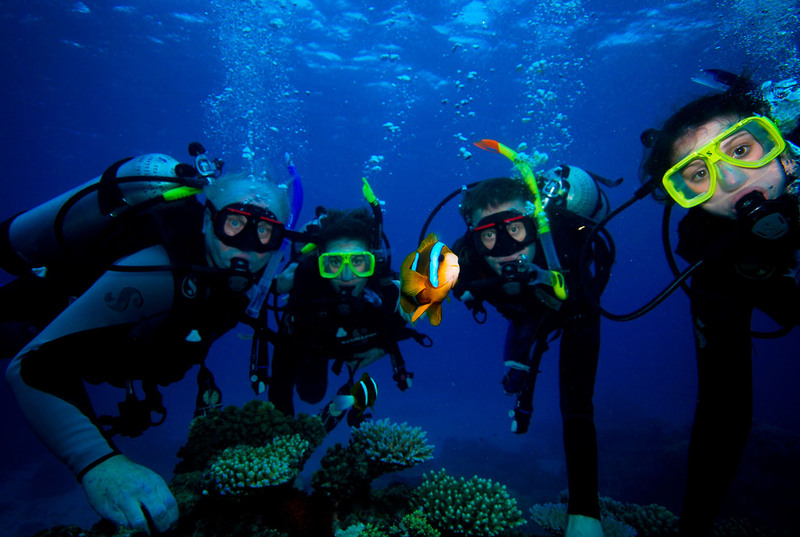 After a 90 minute, sea-sickness inducing ride to the reef, Kristin, Ali, Dad and I donned our diving gear to explore the world’s largest reef system over a series of three dives. In addition to some of the more standard underwater inhabitants, we were lucky enough to see a few sharks swimming around a formation known as the Three Sisters in Milln Reef. After a welcome return to solid ground later in the afternoon, we boarded the tour bus back to the Angsana Resort and Spa located in a northern suburb of Cairns called Palm Cove. After an early dinner to replace the meals that we, er, shared with the fish, it was off to bed in preparation for the next day’s activities. 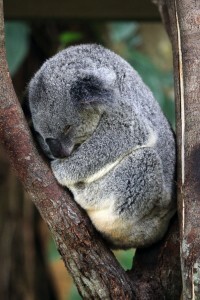 In addition to the world famous reef system, the Australian state of Queensland is also home to several rainforests. Known as the “Wet Tropics of Queensland” on the UNESCO World Heritage list, the state holds the unique distinction of being the home of two adjacent World Heritage listed sites (the reef being the other one, of course). 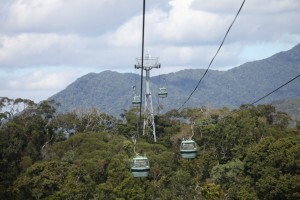 Fortunately for us, the Kuranda State Forest was conveniently located a short drive away from the hotel. It was made accessible by two fantastic means of sightseeing transportation: the Kuranda Scenic Railway and the Kuranda Skyrail Rainforest Cableway. Our itinerary started with boarding a morning train to take us by waterfalls and across bridges to the end of the line, deep in the forest. After disembarking, we found ourselves in the town of Kuranda, a small settlement that seemed to be purpose-built for tourists. Through the course of our exploring and souvenir shopping, we happened upon the Kuranda Koala Gardens. As you may know, holding wildlife is against the law in New South Wales and Victoria, but not so in Queensland. Therefore, since we were spending a weekend in Queensland, one of the goals was to find a place for the girls to hold koalas. Luckily for us, the Kuranda Koala Gardens fit the bill and even let us take as many of our own pictures as we wanted. 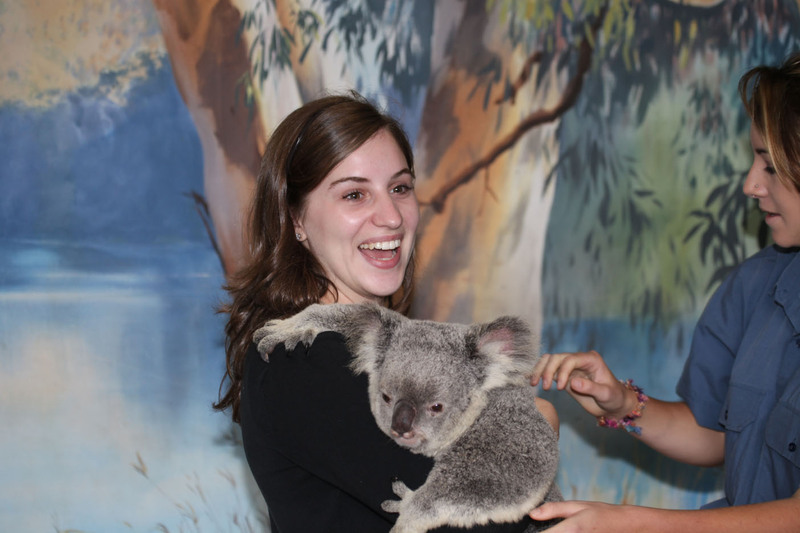 If you find yourself in the area and want to hold one of Australia’s iconic furry marsupials, the Kuranda Koala Gardens is highly recommended. 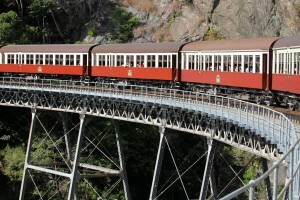 We then headed back to the top station for the Kuranda Skyrail to make our return trip down to the bottom of the mountain. Suspended above the canopy of the forest, the Skyrail gives tourists a birds-eye view of the flora and occasional fauna below. There are a couple intermediate stations on the way down, giving passengers a chance to explore some of the forest from the ground as well as from the air. Upon reaching the bottom, we continued on to our final stop of the tour, which was a few hours at the Tjapukai Aboriginal Cultural Park. There were a variety of sessions about Aboriginal life and culture, but the most fun activity by far was learning how to throw boomerangs. Just make sure to keep an eye on them when they’re on the way back! 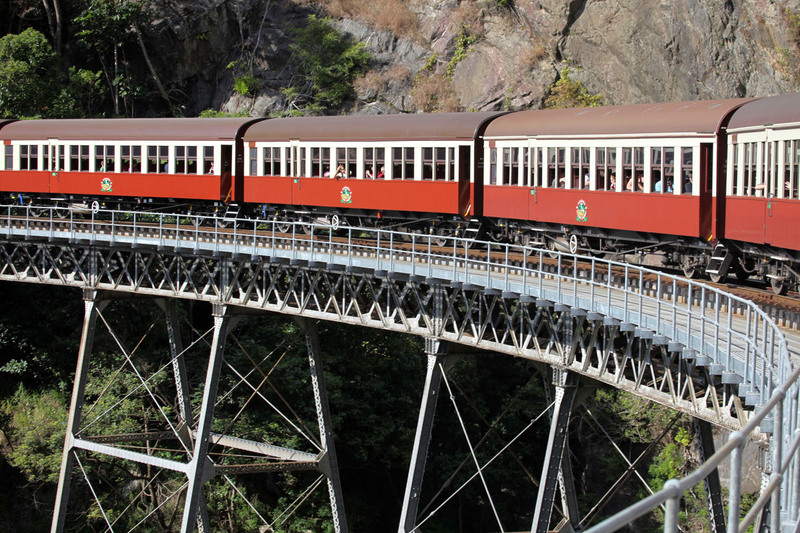 The Kuranda excursion marked the end our trip to Cairns, so we checked out the following day and flew back to Sydney for a bit more sightseeing before the next set of excursions.